Workers Memorial Week 2017: A time to weep…and to organize! 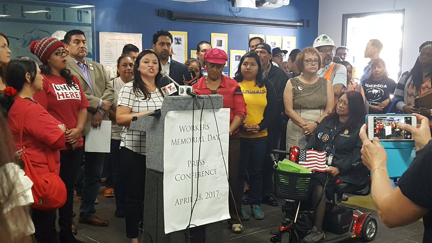 Read more about Workers Memorial Week 2017: A time to weep…and to organize! The National Council for Occupational Safety and Health (National COSH) announced today “The Dirty Dozen” employers of 2017, highlighting companies that put workers and communities at risk due to unsafe practices. The Dirty Dozen 2017 report is being released in observance of Workers’ Memorial Week, honoring workers who lost their lives on the job, as well as those who suffered workplace injuries and illnesses. "This is not your normal educational conference,” said National COSH’s Marcy Goldstein-Gelb, kicking off the 2016 National Conference on Worker Safety and Health last week at the Conference Center at the Maritime Institute (CCMIT), just outside of Baltimore. “We're planning for action." Bethany Boggess and Al Vega, two tireless and effective COSH movement leaders, were honored today by the Occupational Health and Safety (OHS) section of the American Public Health Association (APHA). Al is a former member of the National COSH board of directors, while Bethany helped create the U.S. Worker Fatality Database, now hosted at NationalCOSH.org. “Our hearts are breaking today for the victims, family members, and survivors of the tragic, senseless mass shooting at Pulse night club in Orlando, Florida." Marking the anniversary of the signing of the Occupational Safety and Health Act in 1970, Workers' Memorial Week is a time of action for workers’ centers, unions, community groups, health and safety advocates, and the families of victims, campaigning together for safer workplaces. Safety experts from the National Council for Occupational Safety and Health said today that new federal limits on exposure to deadly silica dust will save hundreds of lives every year and make workplaces safer for millions of workers. 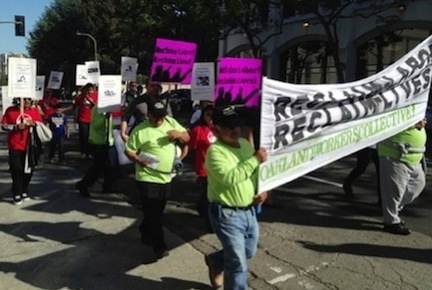 Workers’ Memorial Week is coming… are you ready? If you are interested in standing up for safe work, National COSH has suggestions and resources for organizing your own WMW event. Read more about Workers’ Memorial Week is coming… are you ready? On January 14, over sixty health and safety activists from around the country participated in National COSH’s first Webinar on Worker Fatalities. A recording of this webinar, invaluable to any groups or individuals interested in the latest resources to address the tragedy of on-the-job deaths, is now available to you here.